Bangalore: Metropolitan India yearns to project a global face but it is hardly able to provide basic amenities to its citizens. Bangalore, India’s Silicon Valley, stands out as a classic example of the country’s shoddy urban infrastructure. Corruption in public services and scams involving private contractors across other big cities such as New Delhi and Ahmedabad only reinforce the trend. 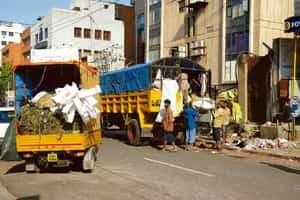 Earlier this month, the Bangalore municipal corporation, or Bruhat Bengaluru Mahanagara Palike (BBMP), uncovered a garbage scam wherein garbage contractors in connivance with health and medical officials had funnelled out Rs60 crore by neglecting to clean the city’s streets and producing fake bills. This is yet another instance of how India’s Silicon Valley is struggling with its poor infrastructure and sanitation and apathetic governance. Waste management experts say only awareness among citizens and monitoring of private contractors can set things right in India’s technology capital. Every monsoon the city’s drains overflow and mix with uncollected and untreated garbage. As a result the state-run Epidemics Disease Hospital overflows with cases of leptospirosis, amoebiasis and infectious hepatitis. “Every year there will be so many cases that there won’t be enough place to put beds," said a doctor at the specialist hospital with 120 beds. The frequency at which garbage scams occur increase as India’s garbage grows at an estimated 5% year-on-year. Across Indian cities, scams surface, enquiries follow and the well-oiled nexus between corporators and contractors continues. “Garbage is a mafia type of business… There are lots of irregularities," opines Amiya Kumar Sahu, president of Mumbai-based, National Solid Waste Association of India, a partly government funded, in the field of solid waste management. In October, the Ahmedabad Municipal Corporation unearthed a garbage scam at the Pirana landfill site where private contrators were dumping mud and stones in place of garbage and claiming payments for the entire weight dumped in the landfill. Mumbai and New Delhi also time to time sees cases of real botched job and municipal corporation employees siphoning diesel from the garbage collection vehicles, while streets in smaller cities like Kochi and Patna are piled with uncleared garbage. “Waste scams with private contractors faking bills are extremely common in all Indian cities," says Saswat Bandyopadhyay, head of the department of environmental planning, Faculty of Planning and Public Policy at the Ahmedabad-based Centre for Environmental Planning and Technology University. “But (waste scams are) not very common worldwide due to stringent monitoring by the local bodies." No Indian city is in fact clean. In February, Forbes magazine in a report rated India’s biggest metropolises, Mumbai, as the seventh and Delhi as 24th dirtiest cities, respectively. The Forbes report was based on human resources consultancy Mercer Llc.’s 2007 Quality of Life Report on air pollution, waste management, water potability, hospital supplies, medical services and the presence of infectious diseases. So is privatization or outsourcing of municipal corporations’ services to blame? Opinions vary but most say no. “Privatization is good provided you monitor. Nobody is monitoring because their pockets are full," says Sahu of the National Solid Waste Association of India. Municipal bodies across India have varying levels of privatization, with Bangalore about 40% privatized and Mumbai about 50%. The Union government in 2000 notified the Municipal Solid Wastes (Management and Handling) Rules making the local administration of cities responsible for collecting, segregating and scientifically disposing garbage. But the rules are heavily violated. Even private contractors concede there are obvious irregularities in the system. “As of today, 85-90% (of waste) is illegally dumped. There is no scientific method," says M. Goutham Reddy, chief executive officer of Hyderabad-based private waste management company Ramky Enviro Engineers Ltd. Reddy claims that his Rs300 crore company, which manages municipal waste in cities like Mumbai, New Delhi, Bangalore and Coimbatore, belongs to the minority group of contractors which segregates and composts waste in line with the Municipal Solid Waste Rules. But the company hardly has a clean slate. For instance in March, Ramky Enviro Engineers was mired in a controversy over a proposed hazardous waste management project in Gummidipoondi, Tamil Nadu, with local citizens up in arms and financiers like the World Bank on the back foot. Having given up on government bodies and private players, Iqbal Malik, founder director of New Delhi-based non-profit Vatavaran, one of the pioneers in solid waste management in New Delhi, feels the only way out of the maze of garbage scams is to make aware citizens segregate and compost garbage. Vishwanath M. Prabhu, treasurer of Resident Initiative for Safe Environment, an 11-year old neighbourhood association in Tippasandra, a residential area in the east Bangalore, plans to demand daily and regular garbage collection in the upcoming meeting with ward officials held on the first Friday of every month. “Garbage is often lying in the street for two days," says Prabhu. According to him, things were better before private contractors were engaged in 2004. At least BBMP’s workers used to clear garbage at a regular, scheduled time. But BBMP is on the defensive. Deputy commissioner health, K.S. Venkateshappa says: “Garbage collection is going on regularly. There may be some stray incidences." He says the corporation will act on the recently unearthed garbage scam report shortly; the corporation’s audit committee is currently auditing the report. Not only is garbage not collected regularly, it is collected only to be illegally dumped from one street to the next. Some five months back, Bangalore-based non-profit Foundation for Education Innovations in Asia forced corporators to clear the garbage dumped in the slums of Koramangala, a south-eastern suburb of the city. “The garbage had been dumped in the Koramangala slums from neighbouring better localities, making it difficult to even walk there," says Sebastian Devaraj, coordinator of community-based sanitation and slum development at the foundation. The foundation gathered 2,000 from the slum and blocked the roads and, the corporators rushed in to clear the garbage. Community participation and public disclosure are the only ways out of the “cess pool of corruption in city corporations", according to Mint columnist Ramesh Ramanathan, co-founder of Bangalore-based non-profit, Janaagraha, and national technical adviser to Jawaharlal Nehru National Urban Renewal Mission (JNNURM), a Union government initiative aimed at improving the quality of infrastructure in urban areas. JNNURM has proposed laws for mandatory community participation and public disclosure of accounts by city corporations, which many states are in the process of adopting. For instance Andhra Pradesh, Assam and Gujarat have taken the lead in implementing the community participation law and Andhra Pradesh, Assam, Gujarat, Maharashtra, Tripura and Uttar Pradesh have done so for the public disclosure law. In earlier years, non-profits such as the Resident Initiative for Safe Environment, Waste Wise and the Foundation for Education Innovations in Asia in Bangalore and Vatavaran in New Delhi used to segregate and compost garbage, but all of these have stopped or drastically reduced in scale with citizens’ apathy, lack of encouragement from the corporations and the onset of large-scale private contractors. Non-governmental organizations today play a miniscule role in solid waste management as India creates 42 million tonnes of garbage per annum (as per the 2001 census). Between 1997 and 2001, garbage volumes in India were almost steady, but since then it has been growing and is expected to grow at 5% year-on-year with residential and commercial complexes mushrooming across Indian cities. As for Bangalore, which contributes one-third of India’s software exports, gleaming offices of multinationals sit awkwardly amid the choked drains and mounds of uncollected garbage that can result in the outbreaks of cholera and gastroenteritis.